I was more than a little bit excited to be in Africa, even if only for a few weeks. Along with Turkey and Scandinavia, Morocco had been one of the three places in the post-Asian portion of our trip that got us really, really excited. Why? Well, this may come as a surprise, but it had to do with the food. It had been five years earlier on a trip to Spain that we had tasted Moroccan food for the first time—a life changing meal delivered in a tagine, a shallow, clay pot with a fitted cone-shaped lid. Inside the tagine a chicken thigh simmered in a thick honey-sweet broth topped with sticky dried apricots and whole almonds. As soon as we got home we purchased our own tagine and Moroccan dishes became our go-to comfort food, our favorite recipe being a close approximation of that first meal. With few expectations beyond good food and desert camping we headed in the general direction of the Sahara desert, which is to say generally south, driving alongside the Atlantic coastline where men rode horses down the beach. We passed through patches of forest where women wore funny hats with equidistantly-spaced pom-poms hanging from the brims, and past agricultural fields where donkeys were busy pulling big wheeled buggies loaded with grain or passengers. In the town centers, tagines made their appearance, supervised by a cook and attended by young boys who added water to the stew when needed. Whole goats and cow legs hung from hooks outside of ramshackle butcher shops and groups of men congregated on the patios of tea shops. 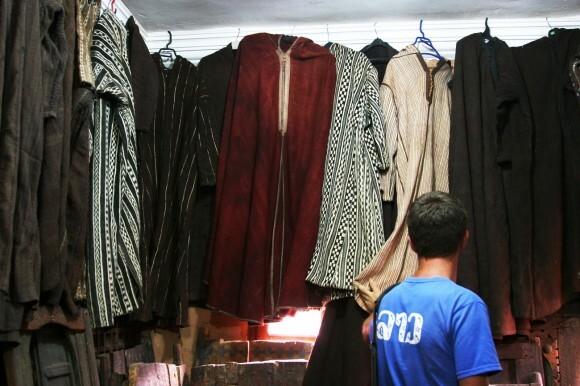 The things that gave the place its identity were the ever present jellabas, loose-fitting ankle-length robes with pointed hoods worn by men and women alike. The men’s were mostly made of natural colored wool in solid or vertical-striped print and the women’s were made of shinier synthetic fabrics, sometimes in bold patterns like cheetah or floral print. Night after night along the Atlantic coast our camps overlooked remote beaches, and our drives were kept interesting by frequent encounters with exotically-dressed locals performing their daily chores in the fields and villages. 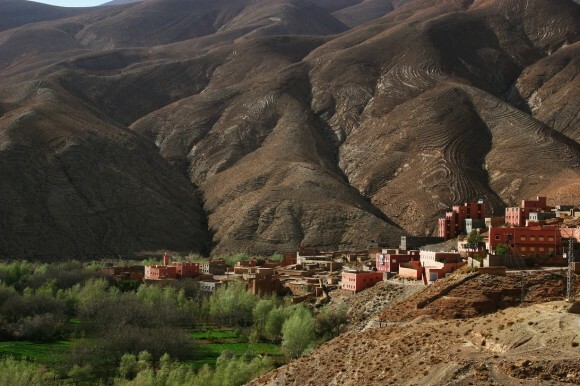 We passed Chefchaouen and Casa Blanca and Marrakesh, and climbed up and up into the high Atlas mountains. 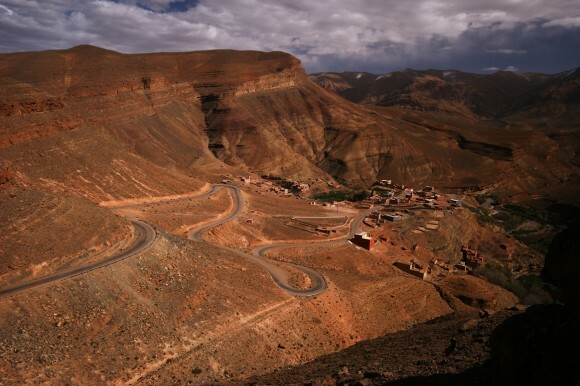 The road wound its way through the rocky desert mountains, bringing a change in both village construction and dress. We summited the mountain range and dropped down the other side to the edge of the vast Sahara desert. 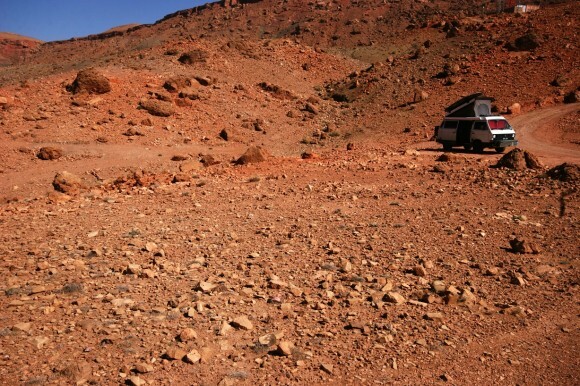 On our first night of desert camping we situated ourselves on the side of a rocky red cliff polka-dotted with dry scrub and shattered, strewn boulders. Across the valley from our camp we watched the sun set over a hillside just above a mud brick village that blended in perfectly with its surroundings. 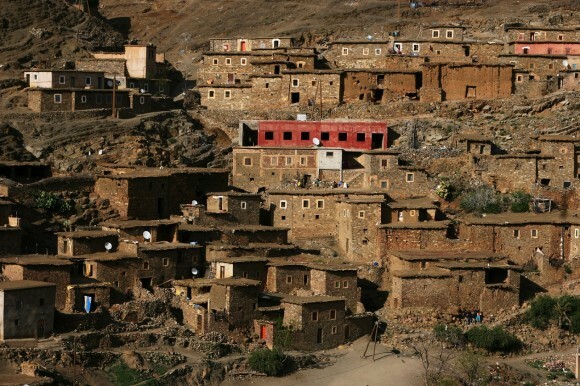 It was a typical village for the area, created from mud quarried on location and left natural in its color with only the perimeters of some windows painted in peach or white. 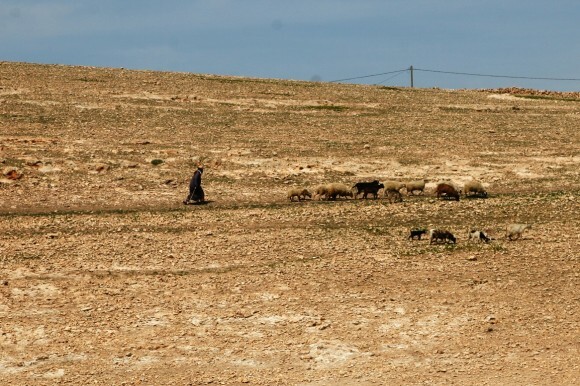 The result was a village that became almost completely invisible in the absence of shadows, disappearing into the hillside each night with the setting sun. Being that our camp was visible to the entire mud-brick village, in the morning two young men came up to visit. One of them lived within one of the red mud walled homes in the village across the way, and to our surprise and delight invited us to his home for tea. 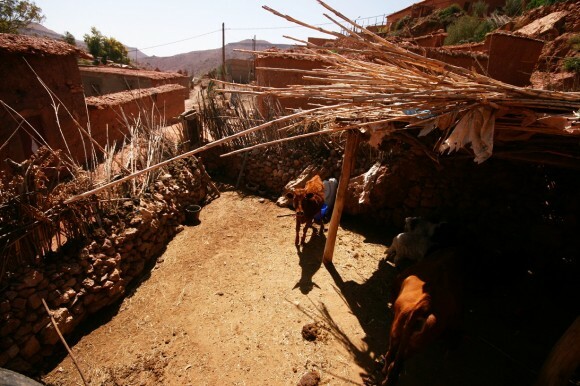 Our new friend Brion hopped in the passenger seat of Nacho and led us down the hill, across a dry wash, and into the village on a narrow dirt track, squeezing through a narrow passage until we arrived at his home. We were greeted at the door by his mother who made us a pot of wild thyme and rosemary tea. After a while we emerged from the house and Brion brought us to the edge of the village to a small grove of date palms and almond trees. Next to them sat the “old village” marked by a gigantic mud tower dotted with random peep holes and tiny triangular windows. Most of the rooms in the old town had fallen to decay but what still existed was used as a manger for livestock rather than for people. 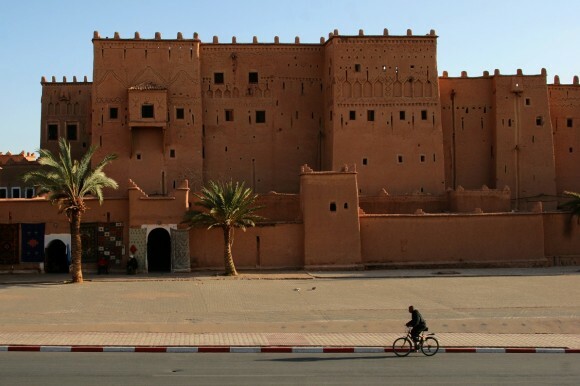 Back on the road we soon came to Ouarzazate, an isolated city known for its 1000-year old Kasbah which once served as a Hollywood backdrop for Star Wars. 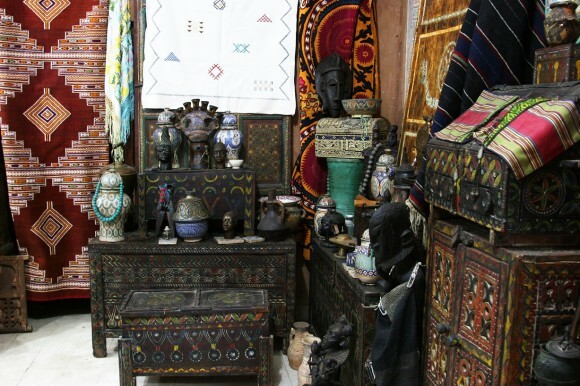 Within a few minutes we had wandered into a shop that was filled with unimaginably beautiful pieces of antique furniture and textiles, embroidered bamboo mats, and fancy painted pots; some for sale and some just for rent to the movie industry to be used in sets. I scoured the stacks of Berber made embroidered rugs and pillowcases while Brad searched for a wool striped jellaba. 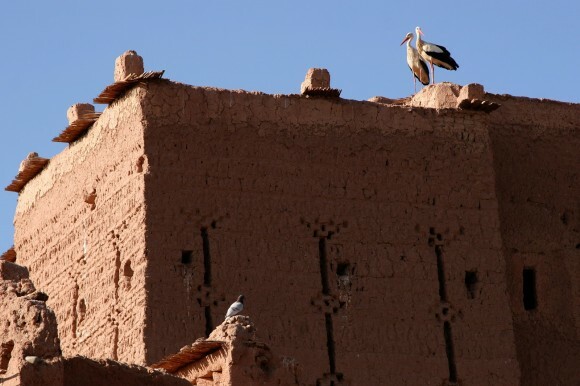 At the top of the four-floored shop there sat a balcony with a beautiful view of the Kasbah. It was here that we drank mint tea with the shopkeeper, Mustafa, watched the neighborhood storks, and admired the antique clay jugs that filled the space in layers. Before we left Mustafa invited us to return in the evening for “tagine and music”. What fun! When we returned Mustafa had converted the balcony into a cozy hangout with blankets and cushions, while for the music part of the evening he went through great efforts to plug in an old metal radio, stringing an extension cord down all four flights of stairs to the only electrical source in the building. 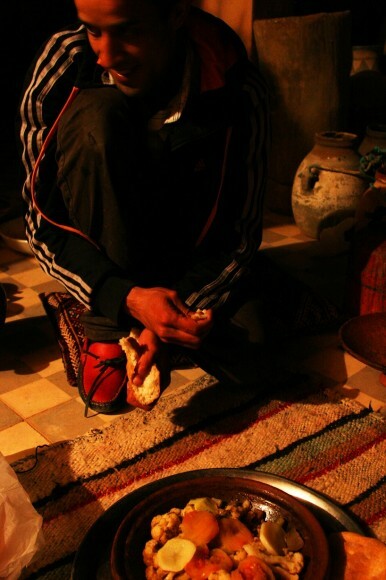 As we drank tea Mustafa began dinner preparations, first soaking the tagine dish in water and then setting it aside. In the meantime he peeled and chopped vegetables, later layering them in the tagine atop a piece of chicken. He sprinkled the vegetables with herbs, added a little oil and water and then set the dish precariously atop a tiny burner screwed on to a propane tank. It was tasty and simple and seriously that easy to make; nothing like the big complicated endeavor I once thought it was. The evening turned to night, and night into the wee hours of the morning while we lounged around under the stars, the desert breeze filling the terrace with cool, dry air. 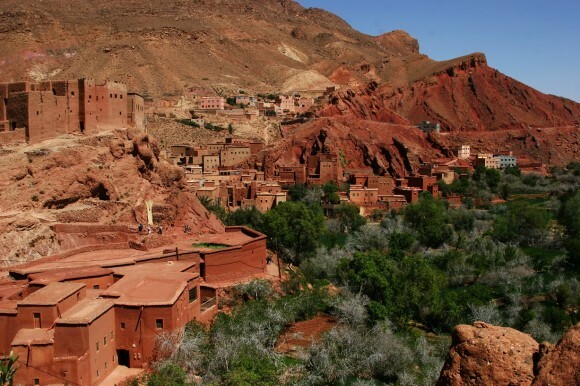 The next morning we continued on our way, driving through “the valley of a thousand Kasbahs” and to the Dadès Gorge, a canyon oasis leading into the Atlas mountains lined with almond and fig trees. 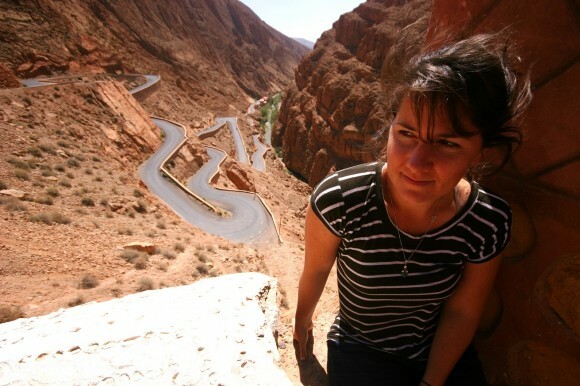 The climax of the gorge came at the top of a set of winding hairpin switchbacks. We stopped at the top and were almost immediately invited to have peanuts and tea with a guy who owned a café. No sooner had we sat down and Brad had given the man a casual compliment on his rocking blue turban than the man zipped into action, grabbing another identical blue turban—seemingly out of thin air—and began to wrap Brad’s head in it. It all happened so fast that Brad didn’t even have a chance to react, and soon found himself dressed like a Moroccan camel rustler. Shortly thereafter we continued up the valley and took a turn on a rough, steep side trail for a lunch break. We found a flat place and Brad set the parking brake and then set off to explore the road ahead on foot. I slid Nacho’s side door open and got to work making tuna salads, and before long an old, ragged looking man carrying a small wooden box approached the door and perched himself right outside of the van, squatted down, and watched me make lunch. Here we were, miles from civilization, and this man was sitting an arm’s length away from me silently watching my every move, and it dawned on me that I didn’t mind. In fact it didn’t seem strange or uncomfortable to me at all. Those months in India during which time our every move was observed by staring masses in close proximity had changed me. After a while Brad came back and saw the man staring at me, and approached him. Brad then spoke to the man in French. He bent down and began to sift through the man’s box—a fairly substantial collection of fossilized shells and trilobites. 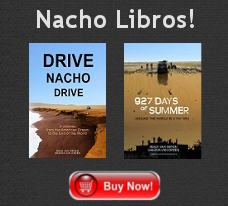 “Yes, you can pick the ones that you like.” The man’s face was worn and leathery, he had clearly led a hard life. “You can pay whatever you like,” the man said. Brad picked up each shell in turn, keeping the ones he liked. “Do you live around here?,” he asked. “Are there a lot of fossils out here?,” Brad asked. His feet were calloused and hard, straining the cracked straps of his plastic sandals as he sat hunched over on the rocks. We chose several fossils and paid the man more than they were worth, and then handed him some food while we ate our salads in silence. When we were done we cleaned our plates and closed up the van. “Can we take you anywhere?,” Brad asked him. “Maybe just up to the next ridge,” the man said, and he got into the passenger seat. 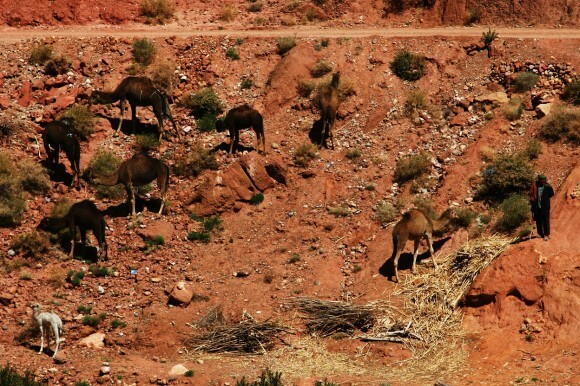 Morocco is 45 minutes by ferry from Europe, but the two are entirely different worlds. This occurred to me as I watched Brad tossing back peanuts and washing them down with tea, his top-heavy cranium bobbing under the weight of his turban, having been unwillingly mummified by a toothless African man. Thank goodness for those 45 minutes and the diversity that they’ve allowed to endure. Fantastic writing Sheena. I could smell the herb tea, love to sip my morning coffee and read of your travels. I wish you both many safe harbors. The recipe for the Chicken Tagine sounds great. Going to try it soon. Thanks for putting it together. That 45 min journey to a different world, have you seen that before in your travels? What I mean is any other places where crossing a border brought you too a truly different place? This story touched me more than I could have imagined. The gift of the turban was incredible, but the most touching was that of the toothless African man, whose demeanor was passive and respectful in light of his attempt to make a living for his family. Your compassionate integration into his world touched me most of all. Sheena, you said you have been changed. You two have also inevitably changed those who have been a part of your journey through your blogs. I’m struck by the sequence of adjustments observed between India, Nepal, Turkey, Italy and Morocco. 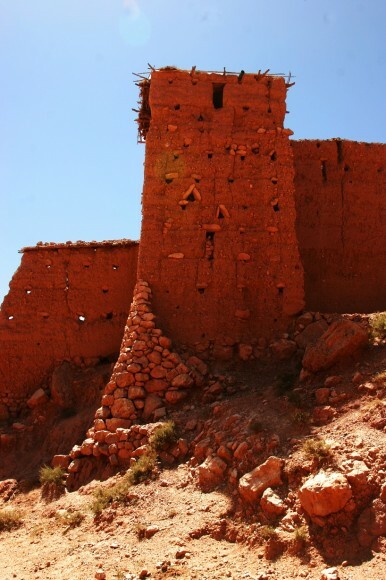 India was a brutal adjustment, but one that benefited you in Morocco. Italy showed how your adventures have changed your affection for previous beloved places. You’ve touched on the essence of traveling and adventure – it forces you into new experiences that stretch, challenge and change you. That is why so many people like me appreciate your dedication to both traveling and writing so that we can hitch a vicarious ride onto your journey of change and hopefully do our own growing. 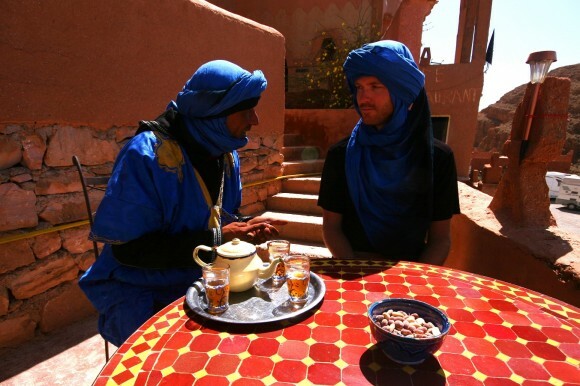 We loved Morocco during our brief time there and can’t wait to explore it more in depth at another time.And the food… you’re right, life changing! Preserved lemons now have a permanent place in my pantry. 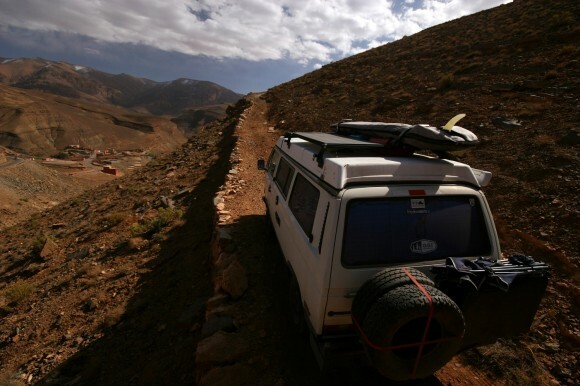 I love the blog, it feeds my own travel dreams as I rebuild my bawindow bus, but if you guys don’t put that surfboard to good use in Morocco I will be very, very, very, sad! 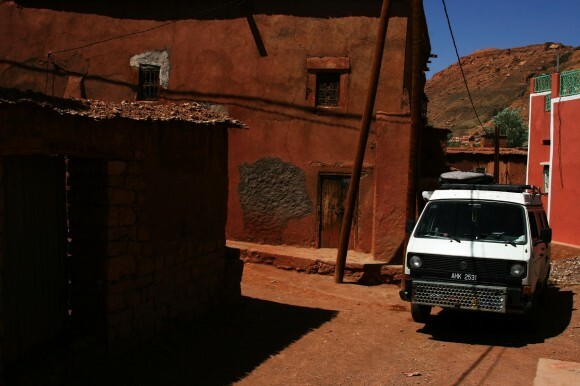 Morocco by campervan with a surfboard ranks very high on my Dream Trips List. I dream of the first meal I had in Morocco from a Tagine with a bowl of dates & olives to go along with it. 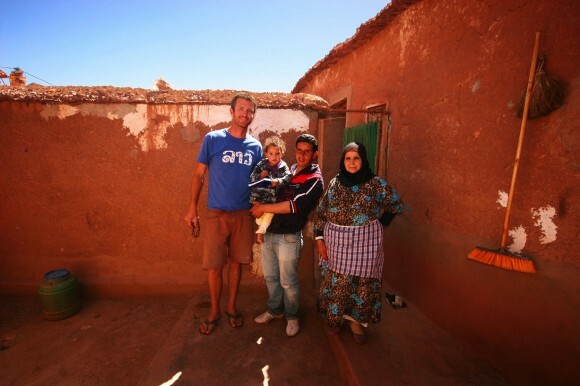 I love reading through this blog and hope to hear more from Morocco. It was a lot cheaper and you avoided the scam artists that kept vigil from balconeys up above the dock in Tangier and selecting who to prey on. 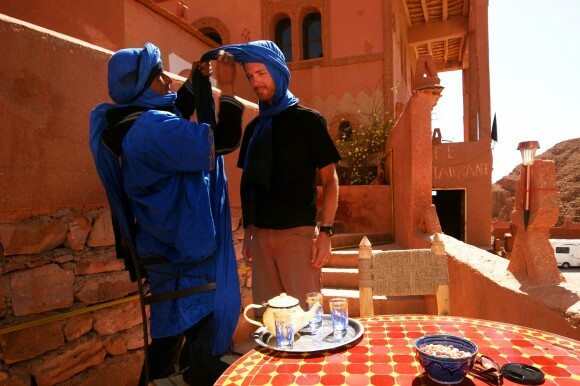 Anyhow, before you crossed over to Morrocco, I felt like reminding you not to miss Essaouira and also the Ourika Valley… Unfortunately, I see no mention of either….tooooooo bad!!! Perhaps one little suggestion whilst you are in bigger cities…it is worth visiting some Riyads…these are refurbished old family dwellings that are walled compounds…but some of them are spectacular..really interesting pastime on a walk about. Hey! take care and keep on trekking. Beautiful! Can’t wait to see it myself. In the photo above the windy road pic, what is all that swirling on the hills above town? Some sort of stepped field or growy area? @ Steve: Yes, please try the tagine! Tonight we are actually “tagining” it – chicken with onion and apricots (no almonds in our pantry). We just can’t get enough. @ Rob: Let’s see, the border crossing from the United States into Mexico and the border crossing from Peru into Chile! @ Paul: You’re right – our travels have changed us, lots of ups and downs…and it’s quite interesting because sometimes you don’t realize those changes until later on down the road when you are faced with a new experience. Or when you’re faced with a similar experience to one you’ve had in the past and later you realize that your reaction to it was different than before. @ Mashoud: We didn’t stay in Essaouiroa BUT we did make it to Eureka valley with the Todra Gorge and the desert oases — quite spectacular. That’s to come in the next blog. 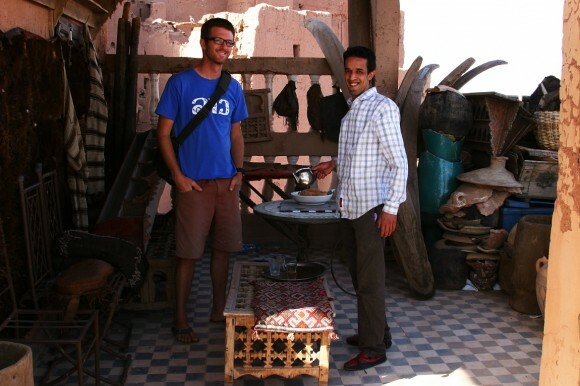 :) We also made it to a few riads but we never slept over in any of them (limited budget). @ James: Brad said it’s the natural erosion of sedimentary layers of rock. Pretty cool huh? What a great story! The thing i love about you guys is the way you never talk about the bad stuff. I had been living in Peru for Four months and it is a good thing i don’t have a blog because no one would want to read page after page complaining about traffic and idiots etc. I can’t say enough thank you to you both for sharing your travel experiences on the blogs. All the stories inspire me to study hard right now and I will take my Pandie one day and explore the world as much as possible. I know you guys want to move to Portland one day. As a fellow Oregonian, I am opening my arms big to welcome you both! Please also consider Roseburg, southern Oregon’s umpqua valley. It has less rain, about 33 inches annual precipitation, far less than Porland’s. There are quit a few engineering companies around here, like Orenco, but we would love to have you, Brad to join us, and bring another powerful company to this area. I love this town, it’s close to Crater lake and there are lots of opportunities here, if I were the Mayor, I would built a lot more river front parks and connect them together for biking and fishing and relaxing, just like the city of Eugene does. Also I would inspire more dynamic healthy business like timber, and fresh organic farms and such… anyway please vote for me! You have to come and visit as least! please let me know if you do. I’ve been following your stories for about a year and have enjoyed them very much. My wife and I hope to take extended trips in our ‘83.5 Subi powered Westy in a few years after our nest is empty, retirement has ripened and Toli, our Vanagon, is finished. We have gleamed great inspiration from you and thank you for that. One question I have is how do you connected to the internet to post on the blogs while traveling? Do you use a hot spot connection, a public library or some other system? Thanks and here’s to more great adventures!